There was recently an absolutely fascinating episode of the podcast 99% Invisible about the development of the concept of jaywalking. It’s most interesting from a futurist perspective if you think about the kinds of discussions they are having about cars, a technology which was still in its nascent stage and for which there was little precedent. Listen to this and then imagine what people in the future will think about the discussions we have around the role and legal status of technologies which are new to us now. We’re the frog in the soup, so we don’t feel the changes and lots of things seem normal; but between 2013 and 2035, as a civilization we’ll be developing and determining the roles of many technologies. Nothing is actually inevitable. My iOS software enhancement wishlist is pretty long. Off the top of my head I can think of: some form of inter-app communication, an easier way to change brightness (or more functional automatic brightness adjustment), allowing minor updates without requiring a restart, and of course some solution to the iCloud/document siloing problem. But the iPhone enhancement I really want is faster app-switching, which I think can only be satisfactorily solved with a hardware modification. I’ve had a web app idea in the back of my mind for the longest time. For reasons I explain, I haven’t tried to do it myself. It has continued to bother me, though, especially in those times when I wish it existed so I could use it myself. Considering its extreme relevance to Valentine’s day, I’ve decided to write it up and just put it out there. As part of the HackDesign course, I read an article about transitioning from development to design. If there is one thing to take away from this email, it is to refrain from mentally separating design and development. When you are creating wireframes, you are implying code that needs to be written. When you are coding, you are actualizing user experiences. To mentally separate each process is the first step towards viewing the creation of software as an assembly-line process. We have a lot of horrendous software due to that line of thinking. Though of course there is a limit to this way of thinking (at some point responsibilities need to be divided to increase productivity), one thing I really like about the mobile device space is that it’s really possible to look at app design as more of a holistic craft. It’s a great feeling envisioning how a control should work, implementing it, and then actually being able to touch the result. When I go running I listen to Roderick on the Line. In this way, my body is exercised but also…my soul. On the episode I listened to tonight Roderick and Mann steered into some seriously philosophical territory, as they are wont to do. What I realized, in that moment, was that the lights of the city, the electric light, has formed a kind of dome over the cities where we live. And it is a protective dome, a protective shield, that shields us from full awareness of how deep and infinite space is. Right, so we sit in our cities, and our electric lights have blanked out the sky, for us, and we no longer have first hand experience of the existential terror that is available to you at any point in time if you just try and spend one night outside on the beach or in the forest. And that is something that human beings knew intimately throughout the whole course of human history. Last week I wrote about how I was considering defecting from iTunes Match to Amazon’s Cloud Player, owing to Amazon’s new ability to purchase MP3s from the iPhone. This week I realized there was a critical flaw with my argument. It’s 10pm, and I’ve just gotten home from work. I check my email to find one panicky message from my aunt. She says she’s lost all her photos in iPhoto. This is my river tracing story. I gave a speech about it at the end of the semester. This is the extended unedited version, along with the English back translation. Two weekends ago I had the chance to go river tracing. You might not know what river tracing means. Basically, river tracing is wading and bouldering up a small stream. 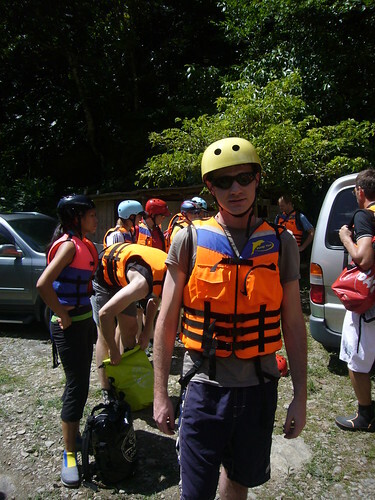 You need special equipment such as a helmet, life jacket, waterproof backpack, and special water shoes.